So $11 million is to be spent to rid Waiheke Island of rats and stoats, the nasty foreign predators making off with our bird-life in their voracious jaws. justice. The Pied Piper of Hamelin would need three flutes to get rid of them. Some of you may have seen this rubbish written by someone who obviously has no love for older people, and likes to shoot his mouth off before he gets his brain loaded with factual bullets. Your maths is all wrong. at the Warehouse in town to save money on the pension. Or to see a friend from time to time. You have built a story out of your own invention, founded on your very obvious bias. is not a daily commute. Again, your own figures prove you wrong. And you have not the slightest idea of how wealthy or not those travellers are. You are guessing. And the plural of bus is buses. 'Busses' is the plural of 'buss', the old word for a kiss. The next step was to fire off an email about this shemozzle to the Mayor, Phil Goff. This was the response. It was not from him, it was from yet another bureaucrat. Thank you for your email to the Mayor. This is an operational matter that the Mayor is unable to assist with. As requested by Hazel Durkin, your permission is needed in order to carry out the collection of the item, as the contractor is concerned about potentially damaging your stairs. If you accept the potential risk, the collection can be arranged within the next week. Please send your response to Lynda Totua, copied in. Weasel words. Notice how bureaucrats minds work. They state a 'seems' or an 'is concerned' or a 'possibility' or a 'consideration' or some such term, based on nothing but bureaucratic imaginings. Next that groundless non-fact is treated as a hard fact. Here, they have chosen 'concern'. Their contractor has a 'concern' that if he uses a trolley he will damage my steps (which they insist, wrongly, on calling stairs). To the other bureaucrats that 'concern' is then deployed as a fact. It ignores the real fact that the publicity about this stupid collection system says that items must be able to be 'carried by two men.' Carried is carried. But bureaucrats are like Humpty Dumpty: 'Words mean whatever I say they mean.' So now 'carried' is 'taken on a trolley.' But it is an unnecessary trolley, because this item can be carried 10 metres. Far further, in real fact, by two men. Real men. Men with muscles. Men who are not lazy and powered by bureaucratic mainsprings. So having changed the English language they invent a 'risk' on top of it, and throw their brainless ball back into my court. I must take the 'risk' of 'damage' to my 'stairs' (steps, people, they are steps). So now they are happy. They have blamed me, so all the inaction on their part will be my fault. Step 1: a groundless 'fact'. Step 2: Treat that as a fact. Step 3: use that to throw the onus off themselves on to the ratepayer. DONE! The above email has established another thing. The Mayor is hamstrung, walled off by bureaucrats from the people who elected him in a landslide. He does not see an email addressed to him. It is diverted. He is prevented from doing anything. It is not worth wasting any more life on this Empire of Mainliner Fools. The inorganic item in question can stay where it is. Unless I get it picked up by a commercial carrier, then take the Empire to the Disputes Tribunal to get reimbursed. Last time I took the Empire there I won. Footnote: It has yet to be established that the Empire has the legal right to create this collection-system for inorganic rubbish in which they can demand access for their contractors to private property to ferret about for it. 'Warwick'. who is two rungs above Hazel Durkin says that making an appointment for them to come gives them that right, but that is a spurious argument, because the system is such that the 'appointment' is made under duress. If you want a collection you must give access, because the system they created demands it. I have just prepared to upgrade to VDSL from ADSL2, because Chorus said it was now available where I am (I only have copper available not fibre, so VDSL is the maximum speed I can get). That should give me a much faster download speed, up from a present maximum of about 7.5 megabits per second to something well over 20Mbps, even more than 30Mbps, depending on which article on the Internet you read. 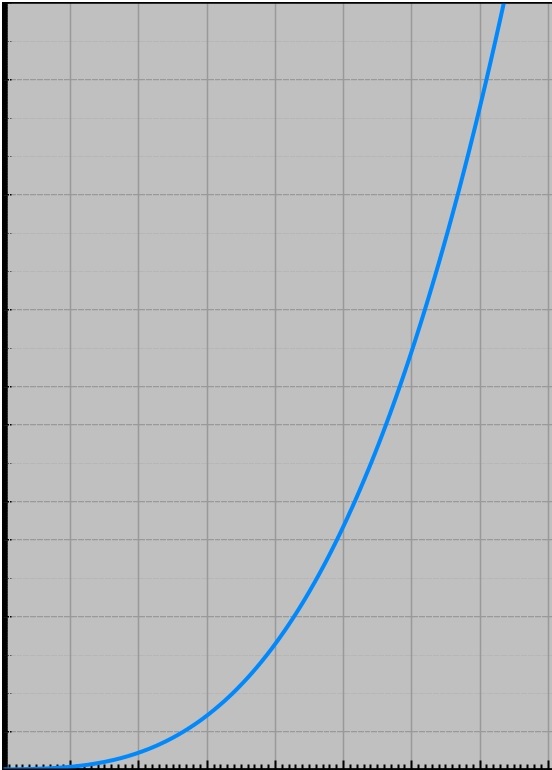 Some data gives 50Mbps as achievable by VDSL. 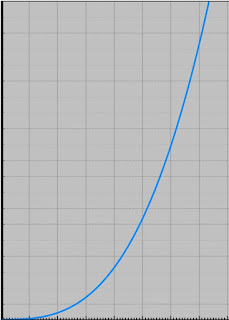 But the super-brain technical bod who reset my router remotely so it would handle VDSL automatically when Chorus connected my line to a different circuit was astounded to see that even under ADSL2 it was signalling to the Waiheke exchange at a massive 21Mbps (and ADSL2 is meant to peak at 10Mbps). So why, if it is talking to the exchange at that speed am I only getting 7.5Mbps from the Internet? enough bandwidth to cope when we are all on line. Which means that all the upgrades on the island by Chorus to ADSL2 and VDSL, even to fibre where it is available, are being hampered by the size of the 'pipe'--the bandwidth of the link between us and the mainland. It has been reported that the Auckland Super-silly is to triple what Waiheke residents are charged for rubbish-collection. If you think about it that is perfectly logical. Because from the point of view of the island the new, shiny, Hide-bound Super-Silly is at least three times the rubbish that the old council was, so it is perfectly logical that we should pay it three times as much of that inflated rubbish we optimists call money so as to keep it three times as rubbishly happy. For some reason they have edited it so that the second half of the interview comes first and the first half second. But as always with public figures it is nice to see the real man speaking for himself, not the fictitious media constructs that we usually have rammed down our throats. A rebel like him would be right at home on Waiheke, the island of rebels. A couple of weeks ago about twenty property-owners in O'Brien Road recieved an incomprehensible circular from Auckland Council. It was written in opaque bureaucratese, it gave no useful information, it talked about proposed changes in 'overlays' in our street that might affect us. That meant little or nothing to most people, because 'overlays' is a technical term used in computer geographical information systems (GIS). Worse, if we tried to get to the bottom of what was meant and went to the Internet and carefully entered the link given, it proved to be wrong. A second letter a week or so letter admitted that it was wrong and gave us a new one. But it too failed to take us to the right place. It too was wrong. After the first one, when I called the helpdesk number given in the letter to find out what it meant, the person who answered said he had only started in the job that day, did not know, and would have to do some research to find out. A day later he got back to me, and after I had laboriously wended through a plethora of web-links at his prompting I finally found out what this 'overlay' was all about, and what it would mean if the Council's bureaucrats were successful in imposing it via their new Unitary Plan. the intersection of Te Whau Drive and O'Brien Road to about halfway down O'Brien Road, is a bluish dotted line. The area bounded by it is what the bureaucrats have determined is to have new zoning rules, and have applied for them in the new Unitary Plan. It covers the public forest (the Kuakarau Bay Forest Reserve), which is fine, but it also 'overlays'--read 'imposes'--draconian changes in the rules that govern what all those property-owners are permitted to do in 25% to 90% of their own properties. What they could do as of right would be slashed. At present, under the existing District Plan, they are permitted, as of right, to build a dwelling with a floor-area up to 10% of the area of their section. So someone with 1000 square metres of land is permitted, without a resource consent, to build a 100-square-metre house, up to 8 metres high. But if the Council's big blue becomes law, that would be slashed, regardless of the size of the property, to a 25-square-metre dwelling. A shed. No more than 5 metres high. Worse, that would apply only to the blue area. So one part of your property would have one set of rules, the other an entirely different set. That would obviously have a big effect on many lives, as well as seriously affecting values, and therefore mortgages. A senior planner in another part of the Council empire said that under Section 85 of the Resource Management Act and the case-law arrived at under it, it is illegal to unreasonably restrict development on private land. What is reasonable is obvious: it is what has been decided during the democratic process that arrived at the District Plan. Thus anything that kneecaps the District Plan is illegal, and therefore one part of the Council is trying to impose what another part knows is illegal. How silly that line is is underscored by the fac that down the bottom it includes a chunk of the sea. So the most anyone would be permitted to build in the sea in that area would be a shed!!! When I appealed to the bureaucrats to admit that that meandering line was a mistake, and to redraw it along the common boundary between the Kuakarau Forest and private properties, not through the properties, and to pull the submission so that we do not have to go through the process of making cross-submission, they refused. They said we have to go through the process. Therefore we have to waste our lives correcting a bureaucratic botch-up. That is bureaucratic thuggery piled on bureaucratic thuggery. For those who affected who want to add their voices to fighting this folly, cross-submissions can be made online. The relevant Council submission is 5716-222. This link will take you to where you can select the form. 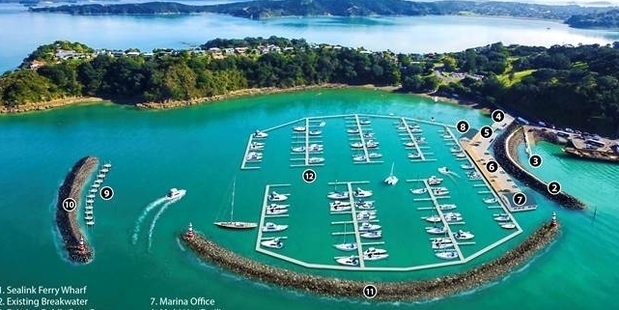 On Waiheke Island, New Zealand, a myth has grown up among a handful of people in the Rocky Bay Village that both the village and the bay at its foot have an alternative name: Omiha. Or, worse, that Omiha is the 'real' name and Rocky Bay is only an alternative of little or no significance and not in daily use. And that 'Omiha' is the original Maori name. All that is at best an ignorant error or a mistaken falsehood, at worst a wilful lie. 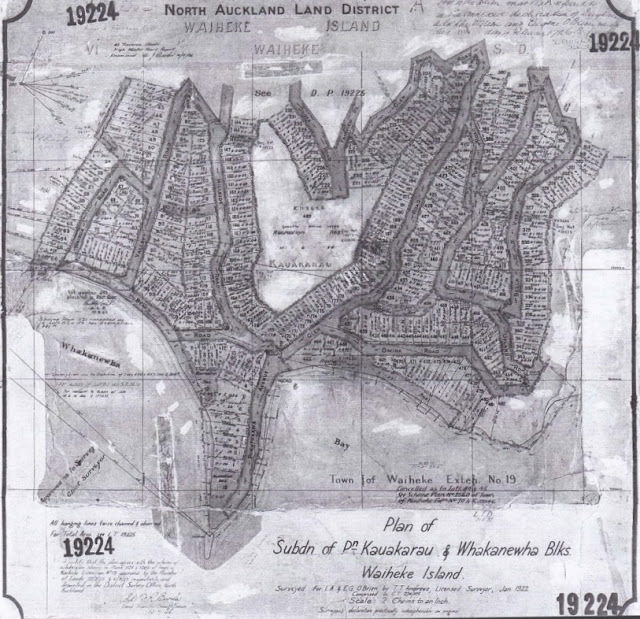 As that map of the original subdivision proves, clearly labelled as such in the middle, the original Maori name of the land that became the Rocky Bay Village was Kuakarau. The land was a block of Maori land called the Kuakarau Block (plus a tiny bit of the Whakanewha Block in the bottom east corner, just above where it says No. 19 on the picture). The old spelling was Kauakarau, as above, but due to the late Kato Kauwhata, who was then the Maori Elder on Waiheke, that was corrected to Kuakarau and gazetted as that by the New Zealand Geographic Board in 2004. 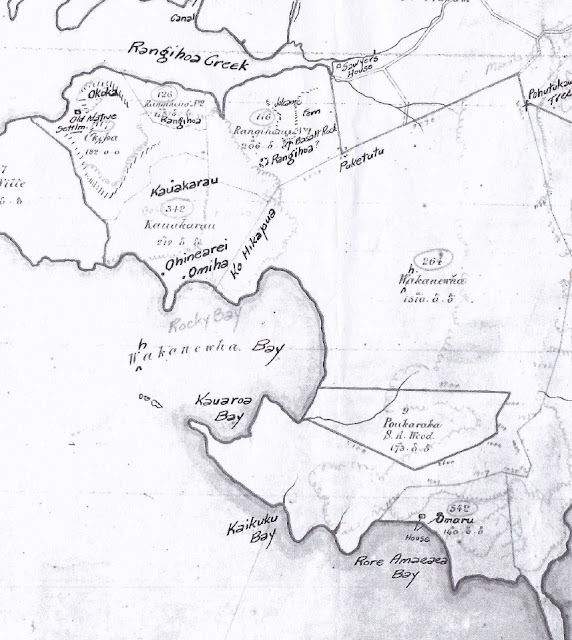 The bay first appears labelled Rocky Bay on an 1865 Maori Land Court map that accompanied a successful claim in that year by three Maori men to joint-ownership of the Kuakarau Block (there is a copy of that map later on this page). In none of the genealogies that they recounted to the Court, which it recorded in the minutes, and nowhere in the Court record, is there any mention of any 'Omiha' or 'Miha' or or 'O Miha' or 'Mihi' or 'Au Miha' (which covers all of the spurious verbal stories about the 'Omiha' name that have been bandied about at various times--none of them with any official documentary provenance and all false). The Court minutes make no mention of a single one of those variations on 'Omiha', only of Kuakarau. Why should it? They are all arrantly false. That block was acquired by a Pakeha in 1897, then farmed. Twenty-five years later it was subdivided and became the present village. As the photos show, such as the one below which was taken in or about 1922 before the subdivision, it was then only farmland and bush. The error, the mistaken falsehood, wilful lie, or whatever it may be in whatever quarter... can be traced to the misreading of a Crown map of 1877--i.e., reading the name of a mere whare (a Maori hut) as the name of a bay, and ignoring the label 'Rocky Bay' and moving that label to Whakanewha Bay. To those blunders were was added work behind the scenes--outside due process of law--by parties with a personal interest that they did not declare, sometimes embellished with a nice little story for which there is no documentary provenance. To that has now been added misfeasance--wrongdoing by officials--blatant, egregious wrongdoing by officials who lied to the New Zealand Geographic Board (NZGB) and wilfully misled it into a wrong judgement. No private, unoffficial sign can change any of the facts, even if it has just been refurbished (in mid June 2017) with a lick or two of paint. An error is an error, not matter how many times it is repeated, or painted. In New Zealand law there is only one lawful way to put a name on the map, and unless that has been done a name does not have true legal status. You must apply to the New Zealand Geographic Board (NZGB), which must investigate the truth, and when it has established the true name, which should be very easy, it gazettes it. That is the due process of law. But in the case of Rocky Bay a few people worked illegally, behind the scenes, to 'establish' a falsehood--namely that 'Omiha Bay' is the original Maori name for the bay, and 'Omiha' the original Maori name for the village above it. Their unlawful efforts have given rise to the 'Omiha' myth, because they created a particle of 'provenance', which looked like truth, but was and is entirely false. Their unlawful efforts were nothing but artificial insinuation, the seeding of illegal records, which were then innocently copied over and over again by people who did not know better and assumed that the falsities were true. Groundless habit stomped all over the Crown and free-custom facts and circumvented due process of law. As well as being unlawful the 'Omiha' myth is wrong: it is entirely untrue. The proof of that was established long ago. In 1877 the government, the Crown, did an extremely detailed map of Waiheke Island, a map so detailed that it even recorded the names of whares (Maori huts) as the names of those who owned them or dwelt in them (in those days roads were virtually non-existent and thus postal addresses had yet to be so dwellings were marked with names). That map clearly recorded the name of the bay as Rocky Bay, as had the Maori Land Court map twenty-two years earlier. And in the area above it, which became the Rocky Bay Village, the map also recorded three whares: Kuakarau, after which the block was named, and two subsidiary whares, Ohinearei and Omiha. So Omiha was only the name of a whare, never the name of either the bay or the village. The notion that 'Omiha' is the alternative name for Rocky Bay is therefore erroneous, a misreading of a map, a misreading that for some became wilful, a misreading given false provenance by force of personality, by mana, by endless self-reinforcing repetition, by the scornful rejection of every bit of the hard evidence to the contrary, by pulling fictitious strings behind the scenes, etc. Worst of all, none of that activity employed due process of law, it evaded, avoided and ignored the process laid down in the New Zealand Geographic Board (Ngā Pou Taunaha o Aotearoa) Act 2008 and the equivalent legislation that preceded it. In short, 'Omiha' was illegally inserted on to the map (by Pakeha who shall not be named here to protect possible sensitivities). There is not a skerrick of true documentary evidence for the notion that 'Omiha' was ever the Maori name for either the village or the bay at its foot. On the contrary. 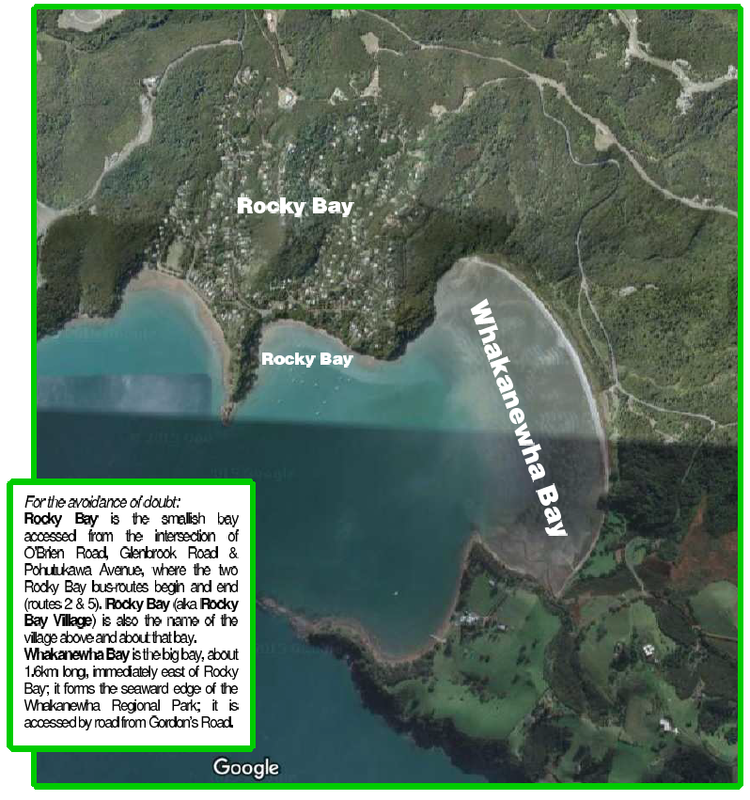 But the solid, independent evidence in official, Crown documentation done in 1865 and 1877 is for Rocky Bay--and no other name--for the village and therefore also the village--all Waiheke's seaside villages take their names from the bays on which they are situated. But, unfortunately, repetition of any myth takes on the semblance of established fact, and in the case of 'Omiha' that has now reached such a state that anyone who shows the documentary proof that there is only name--Rocky Bay--for both the bay and the village is likely to be treated with contempt, pilloried, mocked and scorned, ignored, even abused. In earlier years what was then called the Waiheke Community Board appointed me as Rocky Bay spokesperson, which was perfectly correct, but then, to my astonishment, refused to have Rocky Bay gazetted. Misrepresentation and falsification of history remain misrepresentation and falsification no matter how many times they are asserted. Assertion does not create fact. Fact is what fact is. Endless repetition of an unlawful falsehood does not make it true. The undeniable fact here is that Rocky Bay is the name of the bay and the village. Not 'Omiha.' It does not matter how many times you claim that the Earth is flat, it remains round. To repeat what bears repeating, because it is so often dishonoured, in New Zealand law no geographic placename is official until gazetted by the New Zealand Geographic Board, as laid down in the New Zealand Geographic Board (Ngā Pou Taunaha o Aotearoa) Act 2008. Unfortunately, 10,000 New Zealand placenames have yet to be gazetted--including Auckland, Wellington, Christchurch, Waiheke Island, etc., etc., etc. Thus in the twenty-first century the map of New Zealand is a mess, because there are a vast number of names in everyday use, names that are well-established in free custom, even with a great deal of Crown provenance, but have no official standing in law. That includes Rocky Bay; for despite being recorded officially by the Crown in 1865 and 1877 it has still not been gazetted!!! Or even recognised. One hundred and forty years, surely, is enough time for a branch of modern officialdom to notice what the government's judicial and administrative branches laid down in the nineteenth century--for Crown employees to obey the Crown. Unfortunately the bureaucrats who advise the NZGB, the so-called secretariat, has repeatedly lied to the Board--they committed misfeasance--by claiming that 'Omiha' is the original Maori name, which has misled the Board into making rejecting the truth: Rocky Bay. Original means first, it means that nothing preceded it, and that that is a demonstrable, documented fact. None of the those qualifications apply to 'Omiha'. It is not even an original Maori name for the bay or the village, only for a whare that was there in the nineteenth century, and by 1922 had been long gone. But, of course, bureaucrats cannot bring themselves to say 'We goofed; we'll fix it', so they still fight to maintain the 'Omiha' falsehood. Still, they are in effect rudely telling Rocky Bay people that they do not know where they live. But the official vacuum of 10,000 has enabled unofficial, de facto 'standards' to multiply, and in the case of Rocky Bay they have added seeming credence to the Omiha myth by repeating it in ways that look official but are neither official nor lawful. Google Earth, for example, has picked up the error, as have other publishers of maps, from the worst of those de facto 'standards', and the source of many repeats of the Omiha error, which is the unofficial system, the Address Finder, created and administered by the New Zealand Post Office under the management of a Mr Geoffrey Pearse, its Addressing Services Manager. That system not only perpetuates the myth it has gone so far as to enforce it rigidly. Its Address Finder refuses to recognise Rocky Bay; it only recognises Omiha; it threatens large organisations with the loss of bulk-mailing discounts if they do not comply with its system; and its online version bluntly declares Rocky Bay invalid and only Omiha valid. That bureaucratic ignorance and instransigence means that the computer systems of entities all over the world which access the Post Office system to check the validity of New Zealand addresses are being wilfully and unlawfully misled; and in consequence when people in Rocky Bay fill in their personal details on paper or online they later find that the 'Rocky Bay' they put down has been altered to 'Omiha'--a place that does not, in truth, exist on Waiheke. And is confused with Omaha on the mainland. NZ Post/Mr Pearse points the finger of blame, excuse, justification--call it what you will--at other entities, including the Fire Service, Auckland Council, and Land Information New Zealand (LINZ), and LINZ's list of unofficial placenames, from which NZ Post has chosen not to select Rocky Bay-- despite copious evidence against that and many presentations of the truth. Officers in LINZ, which serves the NZGB, point a finger at the Council and, despite the indisputable documentary provenance, falsely claimed that Omiha is 'the original Maori name' for the 'locality'. Then they compounded that falsehood by not putting it square on the village on its ungazetted map, instead off the side!). So a horde of falsehoods circles the main unlawful falsehood, like crippled rats round a cache of rotten food. One of the countless entities that have been boondoggled by the combination of the Omiha myth and the enforcement of it by the Post Office's unofficial system is of course the Electoral Commission. One effect of that was that not long after I arrived on the island many years ago I found myself disenfranchised--removed from the electoral roll--because my new address would not go into the electoral system. Since then the Electoral Commission has had to add a private area to its system, an area that only its staff can access, in which they can store correct information to counter whatever wrong information the Post Office might insist on. The national call centres of the three emergency services--ambulance, fire and police--also have the wrong name for the Rocky Bay Village in their systems, which creates a dangerous situation, because people in Rocky Bay may only have time to blurt out 'Rocky Bay' before they have to hang up, so the response may be too late. Life and property are constantly at risk due to the bureaucratic botch-up, the unlawful label, the wilful messing about behind the scenes.its system. That danger must be emphasised by repetitition. If you live in Rocky Bay and have an emergency, and only have time to gasp out your street and village, the service you needed would not be able to find you. Your big heart-attack would kill you, the thugs would invade your home, your home would burn to the ground. Therefore that artificial insinuation of a false name, outside law, is not just a chronic nuisance it is life-threatening. The Earthquake Commission is another of the countless organisations that have the wrong information, thanks to the unlawful Omiha myth and Post Office's unlawful enforcement of it (which caused an EQC officer to think that she could drive all the way to the island, because she thought the person in Rocky Bay who wanted an evaluation lived in Omaha, which is up north on the mainland, where the Prime Minister has a holiday home). A huge amount of time and energy all over the world is being wasted, because people are obliged by myth and bureaucratic Post Office intransigence to 'fix' computer data that was never wrong. The danger caused by wrong information in the emergency services is increased by the fact that 'Omiha' and 'Omaha' sound exactly the same, and that there is coincidence of like-sounding street-names Omiha Road and Omaha Drive. The unlawful Omiha myth and the enforcement of it by the Post Office can mean, and does mean, that items destined for a Rocky Bay address may not arrive. They go elsewhere, or you may be told that delivery is impossible so they will never be collected, or they may be returned to the sender marked 'undeliverable'. I was on the verge of being accused of theft because a valuable item from Dell Computers, which was to be paid for on arrival, did not reach me. I finally tracked it down to a courier bin in Christchurch, and the courier company told me that there was an address very close to mine in that city, but it had not been delivered because everything in the address did not match there. In that case I knew something was missing, because of the close call with a serious accusation, but I often wonder how many deliveries never reach people, which they never knew about. It is long past the time that the Omiha myth was acknowledged as a myth that was perpetuated unlawfully, and dismissed and killed off. Only accurate information should rule. Inaccurate information always causes problems, major and minor, and it always wastes time--in this case the time of people responsible for computer systems all over the planet. To get things right, Rocky Bay, and that name alone, should be gazetted for the name of the village and the name of the bay. It alone has the indisputable provenance; it alone has the indisputable evidence; it alone is indisputably the true name for both. The statutes are crystal clear. The Imperial Laws Application Act 1988 says that when due process of law is not followed, when justice and right are denied or even only deferred, then any decision made is 'void and holden for error' and 'shall be redressed and holden for none' (there shall be legal action and the wrong action will be made nothing). That specifically applies, amongst other things, to 'free customs', which that Act gives legal force in Crown low, and in this case 'Rocky Bay' has both government provenance, Crown provenance, and long-established free custom. 'Omiha', the whare long gone, has neither. On top of that, the New Zealand Bill of Rights Act 1990 says that in official decisions 'everyone has the right to the observance of the principles of natural justice,' and the Privy Council has ruled that 'natural justice' means 'fairness writ large.' 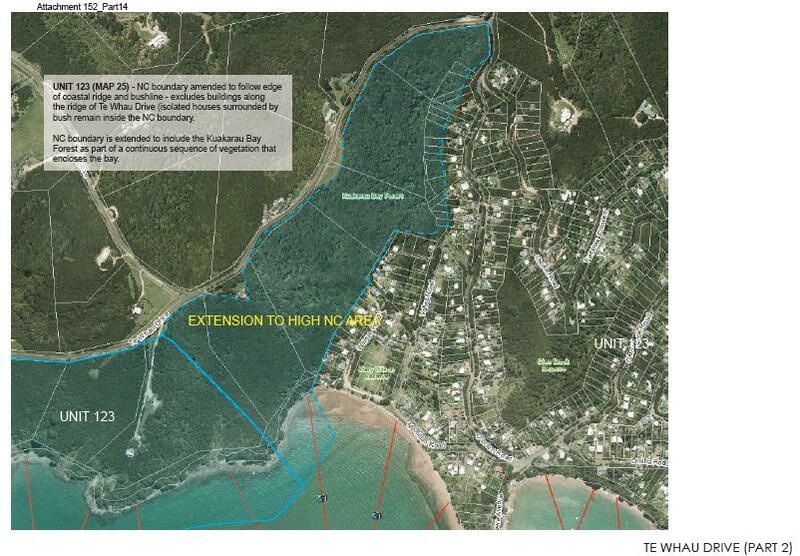 Thus any decision that does not support Rocky Bay as the name of the bay and the village, to the exclusion of anything else, is unlawful many times over. It is not just, it is not right, it is not natural justice, it is not fairness writ large, it has nothing to do with due process of law. And thus it is open to legal action--which should and must be taken against wrongdoing--'shall be redressed'. This matter of the right names of this bay and village should have been fixed years ago with a simple please and a thank-you, but the unlawful actions and misfeasance determined to perpetuate a false name and give it legal claim have now escalated this matter to war. That is most regrettable. But take notice, all those officials who attempt to support the wrong names and refuse to support the right ones, you will face legal action. And statute and provenance and free custom will by the grace of God hand you defeat. Crown provenance of 1877 and the usage of free custom establish the truth; the 'Omiha' myth cannot stand against it. A part of this constant push behind the scenes to get Omiha as the name of the village arises from a nice little story that it goes back to a captured slave woman called Omiha who lived where Omiha Road now is (but NZGB bureaucrats have suggested that it was actually a man called Moses and that it was O Miha, meaning 'Of Moses'; and have also suggested that it is Au Miha meaning rough seas and whale calves). But although strong feelings about an ancestor are very understandable, that does not give those who may have them any right to trample on history, the truth, common practice, established practice and due process of law to get their way, and thereby endanger life and property because 111 calls will bring a speedy response or no response at all. Perhaps the notion that 'Omiha' was the name of the whole village was originally a misapprehension coloured by romantic desire, which then became an article of fond family faith, but the best way of keeping faith with ancestors--indeed the only way--is to stick to the truth. It is certainly not keeping faith with any forebear who got things wrong by blocking attempts to set things right. One of the more recent attempts to set things right was again blocked by behind-the-scenes efforts.They are obliged to be behind the scenes because there are no facts to support them. That has been going on for years: unlawful manipulation behind the scenes to make semingly official the will of a few, perhaps of only one or two families. Every attempt to install the truth has been invisibly killed off. It is disappointing that prime movers for one family deploy great mana to triumph over the historical facts. Those persons are most wonderful and admirable, truly most wonderful and admirable, but even great mana cannot make endlessly repetition of false facts into true ones. And in this case, if they were to be true to what they usually are--blindingly honest and manifesting great integrity--they would change, would side with historical fact, would side with long-established common usage by the rest of the world, would side with due process of law, would cease getting at decision-makers behind the scenes, would put public safety at the top of the list, and would admit the truth--namely, that the two places where 'Omiha' might look official (village and bay) are only false provenance arising from groundless repetition. Then the only support for be for the only name that has true provenance as the name of the village and the bay: Rocky Bay. As all can see, the name of the bay is Rocky Bay--and nothing else. In those far-off days there was no village, just a collection of Maori establishments on which there were four Maori names recorded, two for areas, two for whares. The two names for areas were Kauakarau (a misspelling of Kuakarau that was later corrected by the late Kato Kauwhata who was then Waiheke's Maori Elder, and the correction was confirmed and gazetted by the NZGB), and Ko Hikapua. (Kaukarau is on the map twice, and circled between the repeats is what the librarian at Auckland Museum has identified as 342, a survey number associated with Kauakarau). 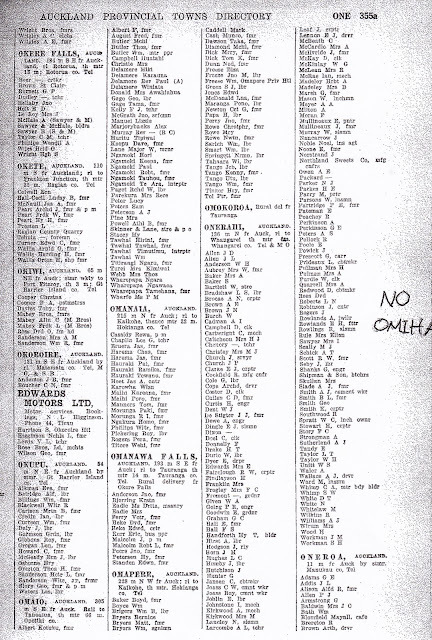 The names of the two subsidiary whares recorded were Onhinearei and Omiha. Omiha is said by some to be a woman, by others to be a man, who lived in that whare; others have other explanations. That spot is now the western end of Omiha Road, so the name of the road, and only that, has excellent provenance. Unfortunately, the name of the Ohinearei whare has been lost to history, because nothing is named after it. The big bay east of Rocky Bay, labelled Whakanewha Bay on the 1877 map, which is now the seaward edge of the Whakenewha Regional Park, and was in those days the seaward edge of the Maori block called the Whakanewha Block, is also misrepresented by the New Zealand Geographic Board's secretariat, as well by many uniformed printers of maps, which label it as 'Rocky Bay (Whakanewha Bay)', which is quite wrong, a fact underlined by the placement of the modern label 'Whakanewha' on the land above that bay, land that does not spill over to the land above Rocky Bay. 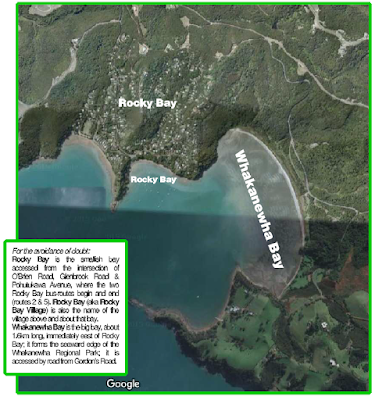 So Rocky Bay is Rocky Bay; Whakanewha Bay is Whakanewha Bay. Two separate names for two bays. That is also what modern usage has long established. Whakanewha Bay is also clearly labelled as that and nothing else on an 1857 Crown map prepared by the Admiralty (detailed further down in this blog article), indeed far more clearly than on the 1877 map. 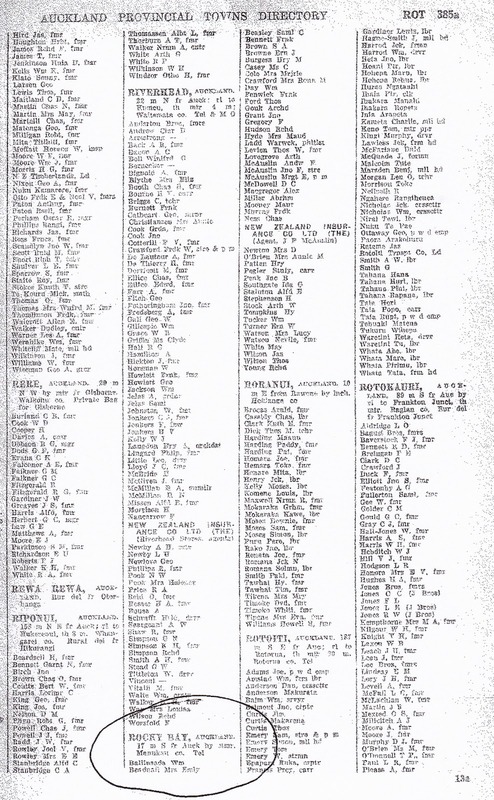 The documentation with the government's 1877 map, which was supplied by Auckland War Memorial Museum, states that the then government recorded the names of Maori whares. They were clearly marked with a small squarish dot beside them to differentiate them from other details. In the Rocky Bay area there are two names beside square dots: Ohinearei and Omiha. Omiha was a whare. A whare. A whare is not a bay or a village. It is a whare. A Maori hut. That makes nonsense of the chronic false insertion of 'Omiha' as the name of the bay and the village. As does the photo taken before the subdivision was done in 1922, which shows no whare; whatever had been there was long gone. 1. (noun) house, building, residence, dwelling, shed, hut, habitation, suit (cards). Not village, not a bay, not a beach. But even if it did include any of those words the government map of 1877 does not plonk 'Omiha' in the bay or splat it across the village area. It places it on a spot that is now one end of Omiha Road. 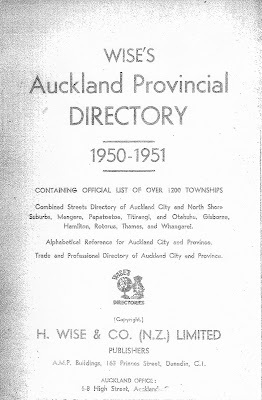 Added to all that ineluctable provenance is Wise's Auckland Provincial Directory of 1950-51, 'containing the official list of over 1200 townships' extending from Gisborne to Whangarei. It had an entry for Rocky Bay on page 132 between its entries for Riverhead and Roranui, but between its entries for Omapere and Oneroa there is nothing--there is no Omiha. Indeed, there is no Omiha anywhere in Wise's, not just not on Waiheke Island. 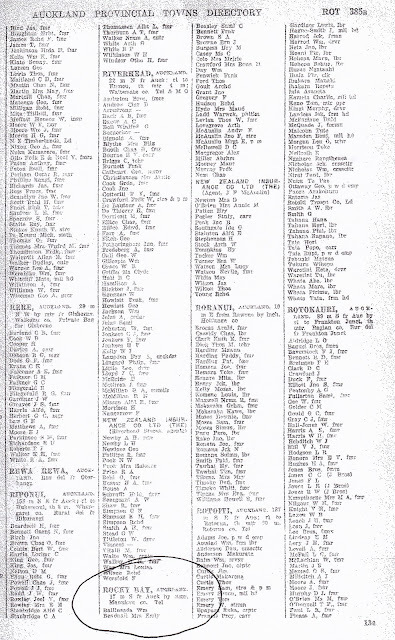 The listing for Rocky Bay did not show the names of every resident, only forty-nine of them, including the New Zealand Insurance Agent, J.F. McAuslin, and Mrs Annie M. O'Brien, after whose family Bush Road was changed to O'Brien Road, which is Rocky Bay's central main road and became the road into the village when it was extended up to the quarry later in the 1950's. Thus it is clear that the Omiha myth has been wrongly pushed upon us behind the scenes in far more recent years. Added to those provenances is the note on this genealogical site (click on the link and search in the text on 'Rocky Bay'), which shows that the famous painter C.F. Goldie, who was born in 1870, holidayed in Rocky Bay in the early part of the twentieth century. There is also the undeniable fact that the Rocky Bay Regatta has been running since 1948, and is never called the Omiha Regatta. In Islands of the Gulf by Shirley Maddock & Don Whyte published by Collins in 1968, she refers on page 280 paragraph 3 to 'the Hodsons at Rocky Bay'. ('Omiha' is of course not mentioned anywhere in the book--it is a non-fiction work). Added to that is the fact that a local Rocky Bay society set up in 1933, which was persuaded to call itself after the woman/man called Omiha whose whare had been close to a parcel of land it purchased, and so was persuaded to call itself the Omiha Recreational and Welface Society Incorporated (OWRS). But, despite that baseless oddity, it states clearly in Clause 3 of its articles of incorporation, dated the 19th of October 1933, that it is there for the Rocky Bay community; it makes no mention of any joint name; it is all Rocky Bay, Rocky Bay, Rocky Bay, and nothing else. There may be some who see exposing the unlawful Omiha myth as an affront to the OWRS, even as an attack on it. It most certainly is not. The OWRS is not affected by establishing the geographic facts from solid historical evidence. Its name remains the same. A society in a village or town or city is not obliged to use the name of its locality, even if logically it should. It can call itself whatever it pleases, as did the OWRS--but as shown it clearly stated that the reason for its existence is Rocky Bay. There may be some who think that exposing the Omiha myth is an attack on Maori and Maoridom. It most certainly is not. It is only on an error that happens to be a Maori word. If things were the other way about and the provenance were for Omiha and the myth was for Rocky Bay it would be the latter that would be attacked as wrong. I have successfully applied for the gazetting of three names on Waiheke Island: Te Akau O Hine, Tanerore Cove, and the correction of a misspelling--Kauakarau Bay to Kuakarau Bay. All are Maori names, and I was proud and happy to establish them in law. No, the attack is on an error and nothing else. Certainty of nomenclature for our whereabouts is important and untoward consequences are always caused by uncertainty and error, particularly in this electronic, Internet age. This is all about setting the record straight. Mr Jones has the right to be called Mr Jones and nothing else, because that is what his documentary record shows and proves. So does Rocky Bay, for the same reason. To persist in calling him Mr Smith because someone decided to prefer that is not just perpetuating a pointless myth, it is not just perpetuating a left-field 'mistake', it is wilfully perpetuating a lie. He is Jones, Jones, Jones. The graphic below is what the official map should show, and what the New Zealand Geographic Board should gazette--these names in these places, and nothing else. That is established local usage, long-established, and it alone should be respected above all else--not a name only used erroneously because of a blunder, a misreading of a map years ago. Until recently what is in Part 1 was all that was known. But now even more forceful Crown provenance has been discovered, with the admirable help of librarians at the Auckland War Museum Library and three divisions of the Auckland Public Library. That multiple provenance adds further proof (not that any more was needed) first that Omiha has no claim to be on the Rocky Bay map as the name of the village or bay, second that to call it the original Maori name is arrogantly false; and third that the true name of Whakanewha Bay is exactly that. 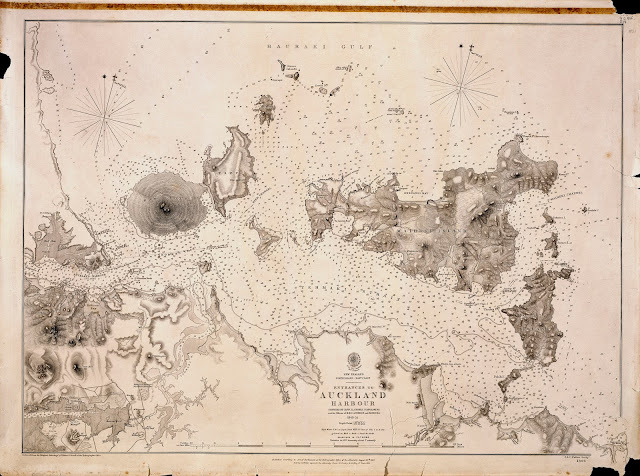 A clearer copy of the 1877 Crown map of Waiheke Island, showing only the Rocky Bay area and its immediate surrounds, is below. As can be seen, Kuakarau (to give it its corrected spelling) is on the map twice, once with dot beside it, which denotes a whare, and once without a dot beneath the claim number 352, which denotes an area. 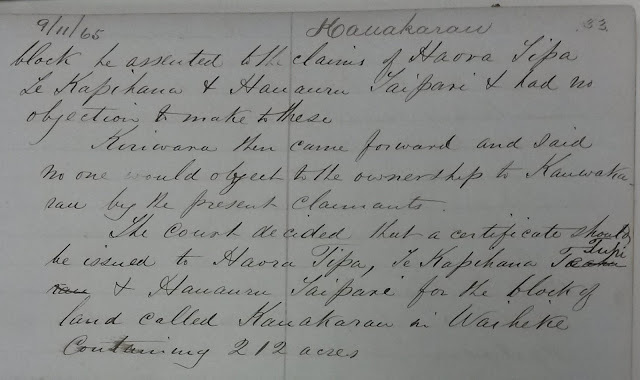 So it is obvious that the owner of the Kuakarau whare was also a major landowner. 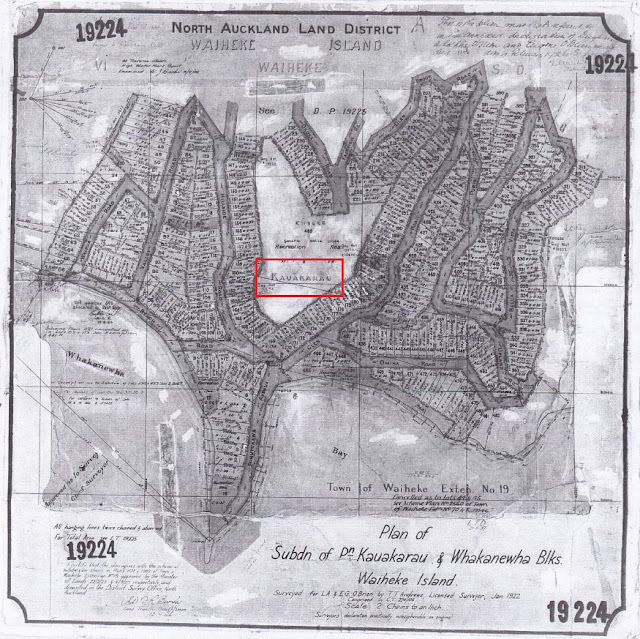 When the land that is now the Rocky Bay Village was subdivided and sold to the public in 1922 by its then owner Judge O'Brien, it covered the Kuakarau Block and a tiny part of the Whakanewha Block (the bottom south-east corner of the village). So the only Maori words that have a Crown claim on the Rocky Bay locality are, primarily, Kuakarau, and to a very small extent, Whakanewha. The whares called Ohinearei and Omiha, which were on the Kuakarau Block, have no claim of any sort to be the name of the village or the bay. They were subsidiary whares on Kuakarau land, and are long gone, and were long gone in 1922. The subdivision map shows clearly that the land was the Kuakarau Block. An excerpt is below, preceded by the clearer scan of the 1877 map referred to in Part 1. The first, to emphasise again, is a Crown document; it is Crown provenance, irrefutable. The second, the 1922 subdivision map, employs Crown nomenclature for the blocks of land involved, the Kuakarau and Whakanewha Blocks. In short, Whakanewha Bay is that, and nothing else. It is not 'Rocky Bay,' it is not 'Rocky Bay (Whakanewha Bay)', it is not 'Half Moon Bay', or anything else it might have been called in word or on maps that have ungazetted terms. And Rocky Bay is Rocky Bay, both the bay and village. It is not 'Omiha Bay' and the village is not 'Omiha'. 'Omiha' has no factual or lawful claim to be a name for Rocky Bay, or any locality on Waiheke Island. Any map that says so is ignorant of Crown fact, it is unofficial and illegal. The Post Office Address Finder, run by Mr Geoffey Pearse, is assumed to be both official and accurate because it is on the Post Office website under the Post Office logo. It is neither. It would be better called Mr Pearse's Address Mangler; it is not official, and is only as accurate as his thoughts. Its consequences can be fatal, and have been, because computer systems all over the world, public, private and corporate, are linked to it. When people who live in a place called ABC, and call it ABC in free custom, particularly when their free custom is backed by long-established provenance on nineteenth-century Crown maps, but the correct ABC is replaced by an incorrect XYZ in Mr Pearse's Address Mangler, the first consequence is that they have been insulted. It is very bad manners. Because when the people in ABC fill out their address, a data-entry person somewhere in the world will find that that will not go in. No matter how hard they try ABC will be blocked by the Address Mangler, which will force them to enter XYZ. That means the people at that ABC are being treated as so stupid that they do not know where they live, and must have their ignorance and stupidity corrected by people with superior knowledge. That is an insult. And the time of countless data-entry people all over the world is being wasted. Further up the scale of consequences is the inconvenience, wasted time and disruption caused by problems with mail and courier deliveries, because they are delayed, or misdirected, or lost, or people are told they cannot be delivered and must spend time making corrective arrangements. The envelope or parcel has ABC on it, but the delivery people are told by the Address Mangler that there is no such place, and they may, as has happened, send it off to some place that has a similar address. Next up the scale is problems with the Electoral Commission, with the worst being that someone may be disenfranchised until the Commission can sort things out. That is on top of the Commission having to spend time and money adding a private part to its database in which it could record the ABCs despite having to print the XYZs on the rolls. By far the most important computer systems linked to the Address Mangler are the ones at New Zealand's national call-centres for the Police, the Fire Service, and the Ambulance Service. When those services are called, people are not talking to local services, they are talking to the national centres. So when someone living in an ABC is faced with a criminal threat such as a home-invasion, or has a house-fire, or is having a heart-attack or some other medical emergency, and calls 111, they are talking to people far away in national centres. And those people know only what is on screen in front of them--which is fed from the Address Mangler, which does not have the ABCs. It has XYZs. So if callers only have time to scream down the phone. 'I live in HIJ Street in ABC' then hang up, the emergency services will not find them, or will take so long to realise the truth that they may arrive too late. That has happened. The worst consequence was fatal. For example, a young woman died on the west coast of Auckland because the emergency services were directed to the wrong place. The national call centre was not at fault. It was the Address Mangler. In the case of Rocky Bay, even adding 'Waiheke' to the scream may not help, because there's a Waiheke [River] in the South Island, so time may be lost on that aspect of the confusion. If Geoffrey Pearse gets it into his head that a place is called XYZ, because someone failed to look up an authoratative source, or lied out of a vested interest or a family interest, or exerted false political interference, or a LINZ official was ignorant, careless, stupid or misfeasant, etc., etc., then Mr Pearse will record XYZ in the Address Mangler--then will stubbornly resist all attempts by anyone in ABC to correct it, particularly if the same unlawful false information has also been artificially insinuated into some Council paper. So all those responsible for illegally perpetuating the 'Omiha' lie and using it to replace the right name, Rocky Bay, the name long-established in Crown provenance and free custom, are all guilty of perpetuating a situation which at best is a daily insult; at middle is inconvenient, disruptive, time-wasting and anti-democratic; at worst is damnably dangerous, and could easily prove fatal. They have put a demonstrable falsehood above fact, above law, above human life. The lie is easily fixed; but they cannot be bothered. Gazette Rocky Bay, then Mr Pearse will be forced to correct his Address Mangler. Those responsible for perpetuating the 'Omiha' lie in some way include Waiheke councillors, members of Waiheke Community/Local Boards, council bureaucrats, Geoffrey Pearse and other Post Office bureaucrats, and misfeasant staff serving the New Zealand Geographic Board. The lie is on their heads; the chronic law-breaking is on their heads; the blood is on their heads. 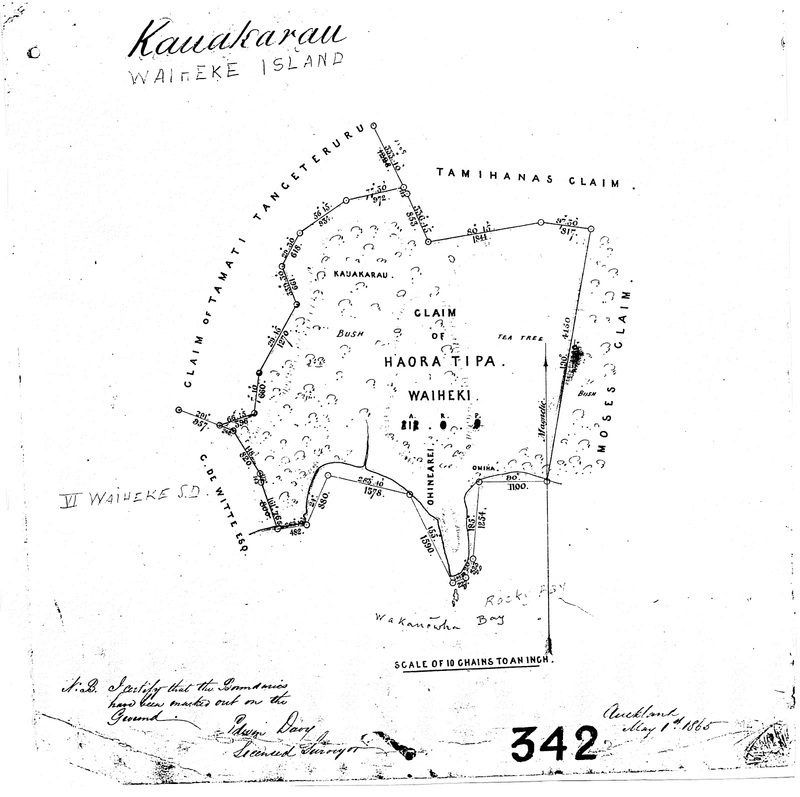 Here, for the final word, is one of the most authoritative words on Rocky Bay, which is the 1865 Maori Land Court map, a map that accompanied the successful claim to joint ownership of the Kuakarau Block by three Maori men, Haora Tipa, Te Kapihaua Tuhi, and Hauauru Taipari. 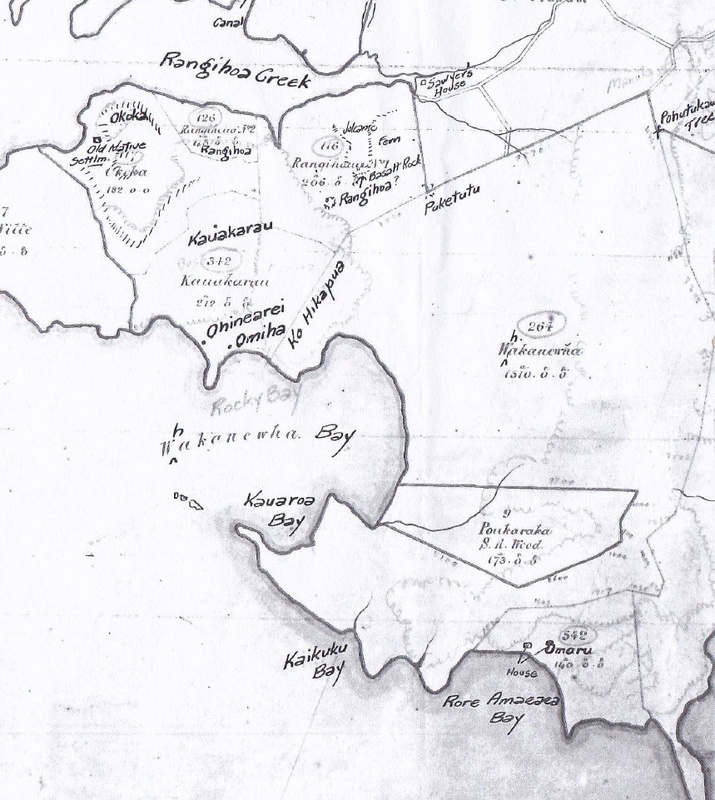 This map clearly labels as Rocky Bay the bay still called Rocky Bay by locals, as it was also labelled on the 1877 Crown map; and it labels the land as Kuakarau (to use its corrected, gazetted spelling); and shows the positions of the same three whares shown more clearly on that 1877 Crown map. This map is as supplied by the New Zealand Geographic Board under an Official Information Act request; it was sourced by Board staff from New Zealand's historical archives. 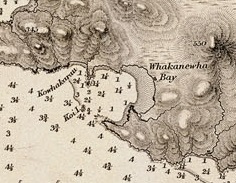 It has three minor errors: Waiheke is misspelt as Waiheki in one place, 'Wakanewha Bay' is misspelt and oddly misplaced from the correct position shown on the 1857 Admiralty map, and Kuakarau Bay (the bay to the left of the promontory) is not labelled at all, but Rocky Bay, the label on the bay to the right of the promontory, is where it should be and still should be and still would be, but for a clerical boo-boo and some actions outside due process of law. Finally, here are the concluding minutes of the 1865 Maori Land Court hearing that that map accompanied, in which three-way joint ownership of the 212-acre Kuakarau Block was certified by the Court. Despite all the above, the farragoes of lies continue. The most reprehensible lie bandied about, which has misled hundreds of people, is a damnable farrago. It says that Omiha is derived from O Mihi, and that Mihi was a woman from the Te Arawa canoe, and that when it called in at Waiheke in the thirteenth century on its way from Hawaiiki to its final landing place on East Cape she chose to stay on the island because she wanted to be with Ngati Paoa rather than continue on with her waka. A part of that story is that Mihi was a princess. The facts prove that all that rubbish is lies, lies, lies, lies. Fourthly, it is very obvious that Ngati Paoa did not exist till long after the original canoes came from Hawaiiki. That iwi is descended from a man called Paoa, who arose much later, about the 1600s, the seventeenth century. So it was impossible for anyone to be joining that tribe in the thirteenth century. The truth is that the original Maori name of the land that became the Rocky Bay village was Kuakarau. 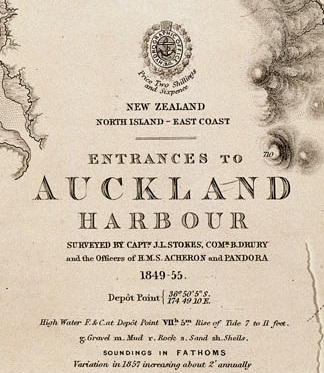 As already shown that is the name shown on the nineteenth century maps produced by the Maori Land Court in 1865 and the government in 1877, and the name shown on the 1922 subdivison map. It was a block of Maori land called the Kuakarau Block. And on both the 1865 and 1877 maps the name of the bay at the foot of what is now the intersection of Glenbrook and O'Brien Roads is clearly marked 'Rocky Bay.' Not 'Omiha Bay'. 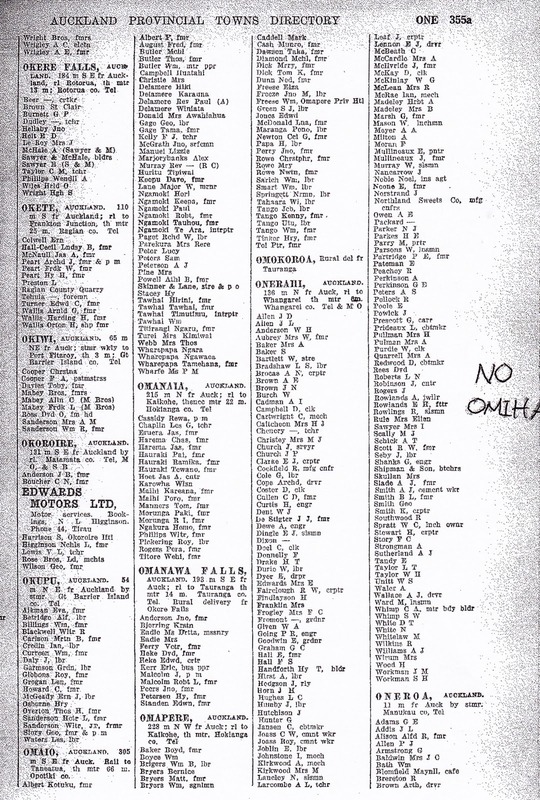 'Omiha' was never anything more than the name of a minor whare on the Kuakarau Block, a subsidiary whare to the Kuakarau whare, as was the Ohinearei whare. It was never the name of a locality, only of a whare. 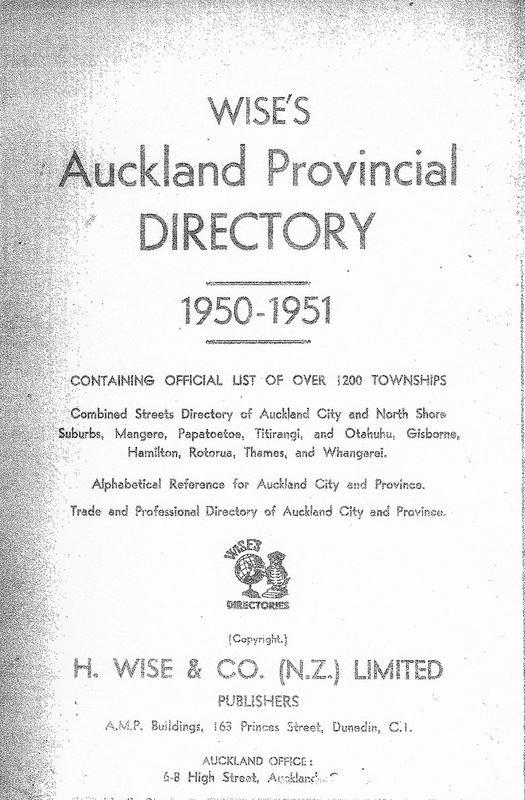 It was illegally adopted as a marketing name by the pakeha subdividers in 1922. They had not a drop of Maori blood in them or their families, but outrageously chose to steal Maori symbolism because they obviously thought that 'Omiha' would sell their 488 sections more readily than 'Rocky Bay.' They also lied in their marketing prospectus, claiming things about the village that were palpably false, which was a criminal offence. Those are the facts, over which the lies have been preferred by knavish bureaucrats, and by which the foolish Minister has allowed herself to be misled. The bureaucrats were lied to, they put the false name on maps as the unofficial name, and pretended it was the original name, and when an application was made to make the customary name official, they chose to make the lie official, and, worse, to confuse the issue by changing the false name by adding a macron over the O, to be oh-so politically-correct. Macrons are a pain to have to add to text on a computer, and many typefaces do not have them, and replace them with something else, so what they won will not be used, which makes the farce even more farcical. The misled 'Omiha' contingent wanted that name; they wanted that unaltered. But what they got from the Minister on the advice of her bureaucrats was an alteration--its spelling changed to a macron-O. Which only PC-diehards will ever use. The phrase 'the naked truth' comes from a fable in which Truth and Falsehood went bathing. Falsehood emerged first from the water, and stole Truth's clothes. Truth, unwilling to wear the clothes of Falsehood, went naked. The truth stays ever true, it stays ever true to itself, it stays ever true to reality, no matter how many lies try to destroy it, and no matter what rank the liars might have.